The 2016-2018 Ram Projector Headlamp uses a 9005 single beam bulb as low beam and a 9005 single beam bulb as high beam. The fog light is a single beam 9006 bulb. To upgrade the projector low beam to get more light output, you can install HID or LED conversion. The Concept Series HID 9005 Kit is the best for its amazing light output. No complicated reply harness thanks to the new HID Smart Ballast. Installing HID is as easy as an LED kit. The T2 Series LED Projector Specific 9005 Kit is the only LED option that fit this application. To install the LED kit, a pair of 9005 Anti-Flicker Harness need to be used to fix the bulb out signal and flicker caused by pulsing power input. If you’re looking to upgrade the fog lights, the T2 Series LED 9006 Kit is a great candidate. 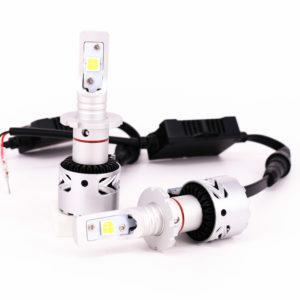 You can also change the front Turn Signal Bulb, Parking Light Bulb, Brake Light Bulb, Back-up Light Bulb and other Interior Bulbs to High Output LEDs.